Find out if your design style is up-to-date with the hottest new trends for 2019. This article will focus on 7 new design trends for this year and how to incorporate them into your space. Maximalism – Rather than sparsely decorated minimal spaces, designers are showing more curated looks that tell a story and bring-in more layers to spaces. We are seeing interiors that have lots of personal items along with classic and traditional furnishings. While not being too busy, each piece is well thought-out, & has a purpose and meaning to the homeowner. To achieve this look try using a mix of antiques, florals and new pieces; incorporating rich colors; and mixing textures and metals. Stick to 2-3 colors and repeat them throughout the space. Eclectic – We are seeing “new” or newly purchased pieces mixed with old/antique furniture and accessories. So, next time, don’t shy away from the antique store, go in and purchase something that speaks to you. And when your grandmother asks you if you want your favorite item of hers, take it! You want your space to tell a story; your history, where you’ve traveled, & what you like? Designers and home owners want their spaces to have soul and personality. To achieve this look, try mixing rattan (a hot trend for 2019) with a jewel-toned green or navy-blue sofa or chair. Don’t forget to add textures and repeat textures throughout the space. If your furnishings are neutral, add jewel-tones, floral pillows or paint to your walls. Then, ad-in an antique truck or vintage table along with a soft cozy throw. Add photos of your travels, friends and family to finish the look. And, choose photo frames made with the same finish. It’ll give your room a cohesive & fresh look. Today’s spaces should be deeply personal and tell your unique story. Curved Furniture – Designers are using more and more curved couches and chairs in rich velvet and soft fabrics. We’re seeing curved coffee tables and end tables incorporated into this look too. If you’re not sure about this trend, try purchasing just one item, like a curved settee or sofa or even a barrel-back chair. Another option is to purchase a Tulip Table for your kitchen and add funky chairs. It’s a more modern and contemporary look, but you can tone it down by mixing in antiques and soft fabrics to add style & comfort. Black and White Color Pallets always add LOTS of DRAMA! To achieve this look without your space looking too stark, try adding in 1-2 accent colors & textures like: wicker or rattan, metal accessories & throws. Stick to black and white as your main colors and add the other color thru smaller pieces like accessories, so your room is crisp and well put-together. Farmhouse is still going strong this year and can be used even in modern spaces to bring interest into a room while telling a story. Contemporary or urban city spaces can bring in the farmhouse look with vintage like old signs, clocks, and smaller antique accessories like tool boxes, books, trays or toys. These items will warm-up the space, bring it up-to-date and help tell your story. Remember, you don’t have to spend a lot to achieve this look. Retailers like Kirklands, At Home and Homegoods, often have inexpensive items to achieve the Farmhouse look. “Plant-fluencers” – Need a new buzz-word this year? This one means people who bring plants into their spaces, both for sustainability, life and cooking. More and more millennials are looking to add plants into their spaces, and designers always rely on plants to give life to a space. So, ditch the fake dust-collecting plants and add real ones instead! Not sure about this trend, try herbs for the kitchen like basil, cilantro and rosemary. They’re easy to grow, smell wonderful and can be used for cooking too! Other easy-to-grow plants are: Succulents, Asparagus Ferns, Fiddle Leaf Fig, Yucca and Guiana Chestnut plants. You’ll breath better and will breath life into your home! Heavy Metals of all Kinds – We are seeing 2 hot trends here: mixing metals of all kinds into your design and incorporating lots of polished brass. Hot metals making a comeback are: copper, nickel, polished brass and black mat finishes. Best of all, you can mix them, so you don’t have to worry about being all “matchy-matchy.” If you’re scared of trying this trend, try adding some polished brass pulls on your kitchen cabinets or changing out bathroom fixtures and pulls. You can also try mixing metals with accessories. It’s an inexpensive way to update your space. Want more design & staging advice? See our next issue for 7 other design trends for 2019. We’ll also talk color! Let’s face it, the easiest and most cost-effective way to update the look & feel of a space is with paint. Yet, many homeowners will skip this important step BEFORE putting their house on the market, because they don’t want to spend money on a house they are selling. What homeowners don’t realize is the value they are losing by not painting and not choosing the right colors that will bring them BIG returns on their investment. In other words, sellers are losing money by not painting their home before putting it on the market! This article will outline of few of the BEST paint colors to use that will increase the value of your home at resale. 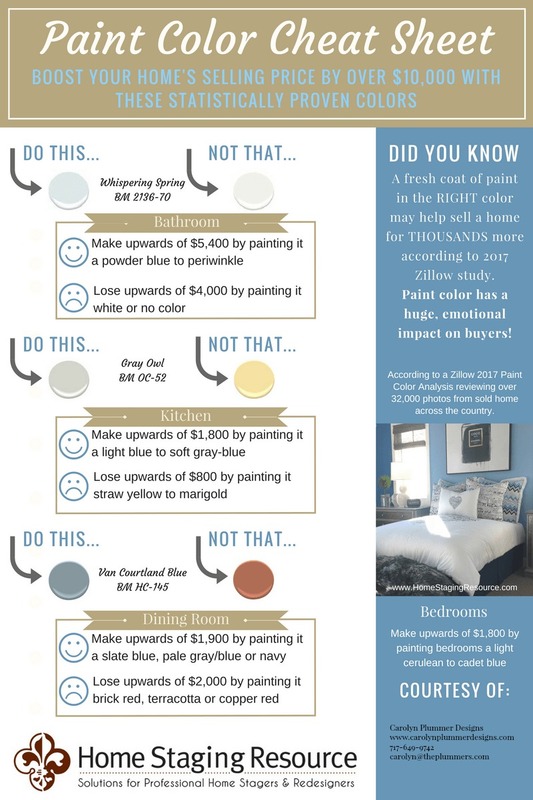 According Statistics from Home Staging Resources, Inc., selecting the right ﻿paint colors can increase the value of your home by as much as $10,000. So what are the best paint colors for today’s Buyers? Bathroom/Bedroom – Make upwards of $5,400 by painting these rooms a powder blue or periwinkle shade. These shades are soothing, relaxing and more conducive to sleep as well. For example, try using Benjamin Moore’s “Whispering Spring” BM-2136-70 or “Palladian Blue” BM – HC-144 or “Glass Slipper” BM – 1632. Kitchen – Sellers can make upwards of $1,800 by painting a kitchen a light blue-grey. For example, try using Ben Moore “Grey Owl” BM OC – 52. The white kitchen trend isn’t going anywhere, so sellers may want to consider painting cabinets a cream or white such as Ben Moore “White Dove” OC – 17 or Sherwin-Williams ”Alabaster” SW – 7008. Make sure you are coordinating the cabinet color to other fixed items in the space such as flooring, counters and trim. If you need help, call-in a paint color consultant. They will help you select colors that are harmonious and will add value to your home. Dining Room ﻿﻿﻿﻿– Make upwards of $1,900 by painting your dining room a slate blue, pale blue/gray or navy rather than reds or burgundy. Try Ben Moore “Van Courtland Blue” BM HC-165. If your room doesn’t lend itself to these shades stick to neutrals like Ben Moore “Manchester Tan” HC-81 or Sherwin-Williams “Macadamia” SW 6142 or Ben Moore “Muslin” OC – 12. Even Real Estate Agents report that when home sellers opt not to paint "figuring its too much of a hassle", sellers end up losing money because the house sits on the market and loses value the longer it goes without an offer. Today, buyers are busier than ever and want move-in ready homes. In fact, most buyers will overestimate the cost to paint, and will either low-ball their offer, or move on to the next house. And, no one wants that. So, if you want to sell your house for top dollar and NOT LOSE MONEY, paint before you put your house on the market. Your internet photos will look great, & attract more attention, plus you’ll make more money at the closing table!